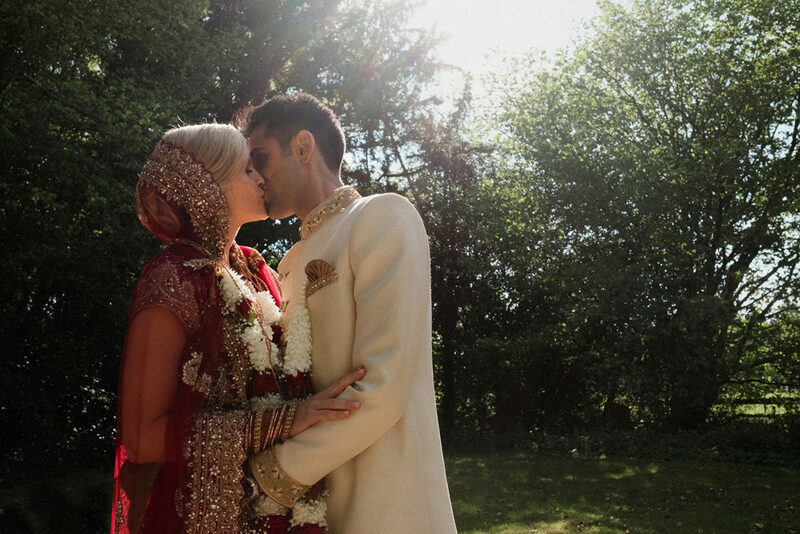 My favourite part of my own wedding day was saying my vows during the ceremony, so I am a little jealous that bride & groom Alex & Anesh got to say their vows twice during their beautiful humanist and Hindu ceremonies, not to mention double the gorgeous outfits. 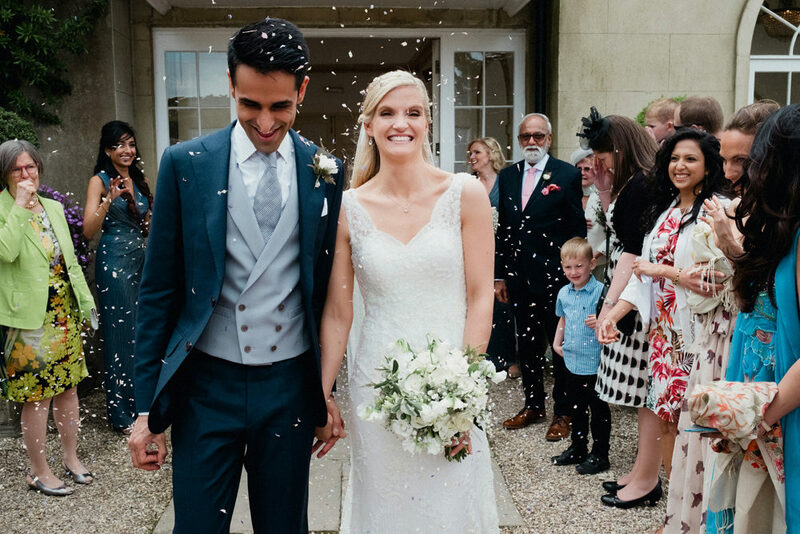 Northbrook Park was the host for this wonderful celebration and fusion of cultures and was a truly beautiful location for Claudia Rose Carter Photography to capture all those precious memories. This gorgeous couple meet and fell in love in the city, so after much deliberation there was only one place for them to say I do. 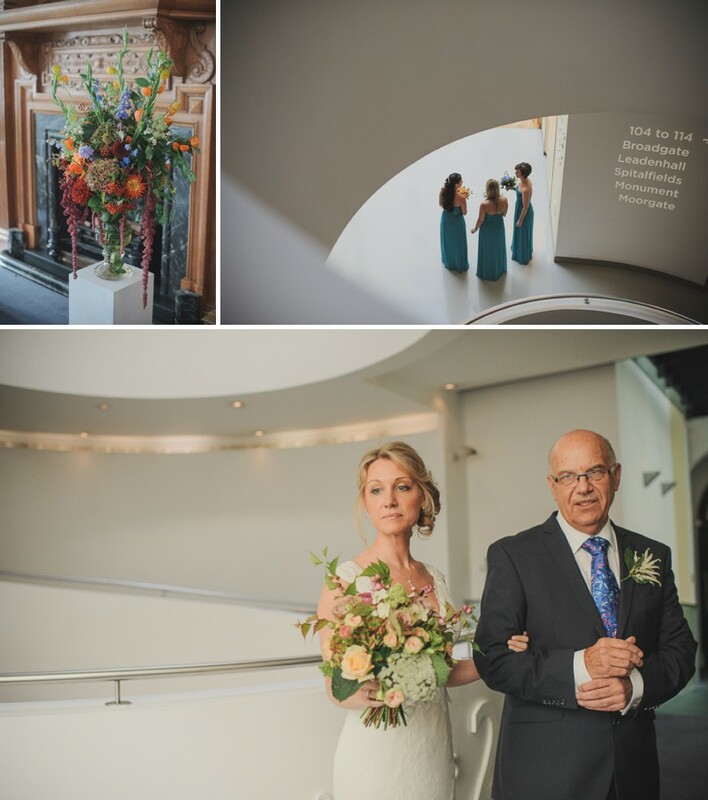 First stop was Wandworth Town Hall which has a spectacular stair case resulting in some truly gorgeous portraits captured by Helen Schryver, followed by a reception at Brunswick House that just oozes charm and history. Laura looks the picture of elegance in her lace Lusan Mandongus gown, pale mint Mimosa Rachel Simpson shoes and blush Liberty in Love feather stole. Which was the inspiration behind the dreamy pastel colour scheme. 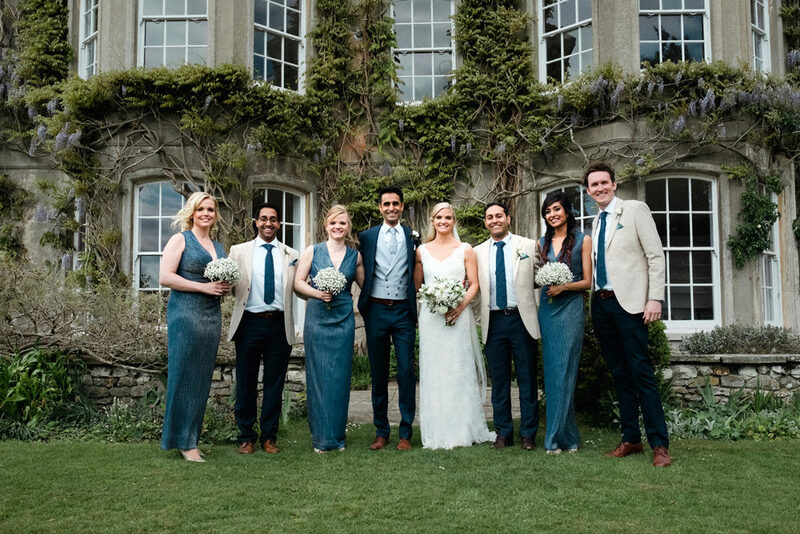 Never mind Britain’s Got Talent, this family’s got talent, with a supplier list full of creative family and friends who couldn’t do enough to make this day as special as could be for Caroline & James. 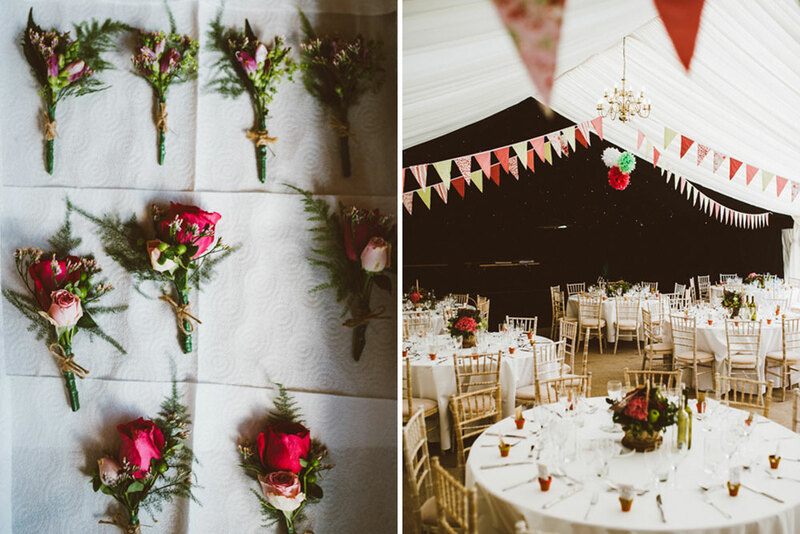 Flowers were put together by Aunties, bunting was made by the bride and there’s also a delicious chocolate flake cake made by the mother of the groom. It was a huge group effort with all the little details coming from the heart. Caroline & her mum even managed to lovingly restore her gorgeous Lusan Mandongus fishtail gown, which is simply stunning. Such a pretty pink palette, amazing dappled sun light and a DIY wedding full of SO much love and laughter to swell the heart. Traditionally, as the rhyme goes, a bride should include ‘something blue’ as part of her wedding attire. 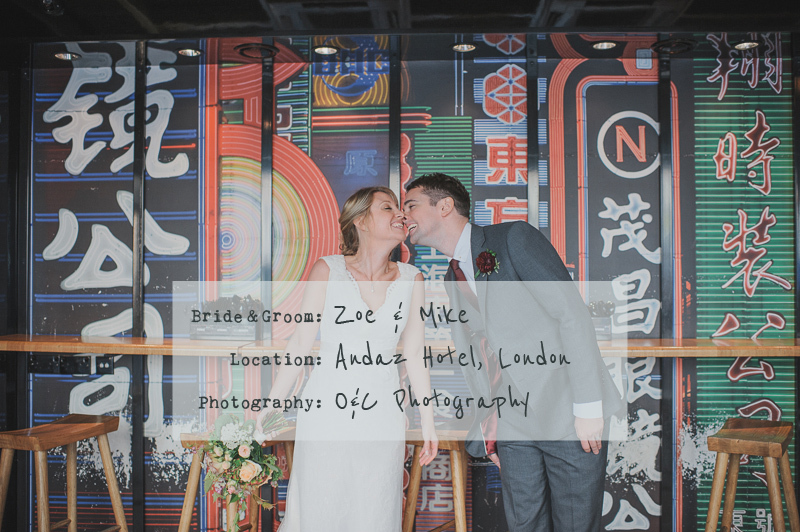 Not so for Zoe who married her beau Mike at the Andaz Hotel in London last year. 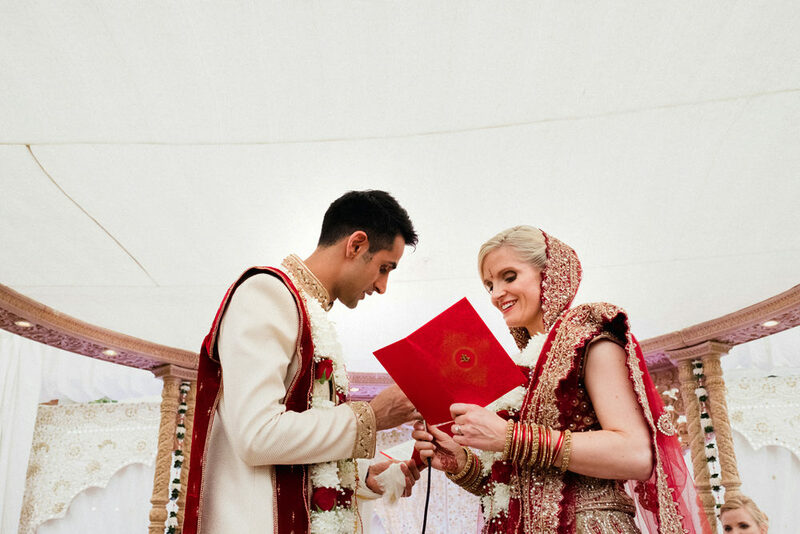 Instead the colour red holds special significance for the pair – a nod to their early dating days – and it was this hue that they included in select areas of their wedding decor including Zoe’s exquisite pair of Louboutins. I know! I’m positively green with envy right now. I’m also seriously lusting after Zoe and Mike’s cake extravaganza which they lovingly scattered along the centrepiece in the 1901 restaurant for their guests to dine upon. Check out the chocolate cake….! Morning folks! 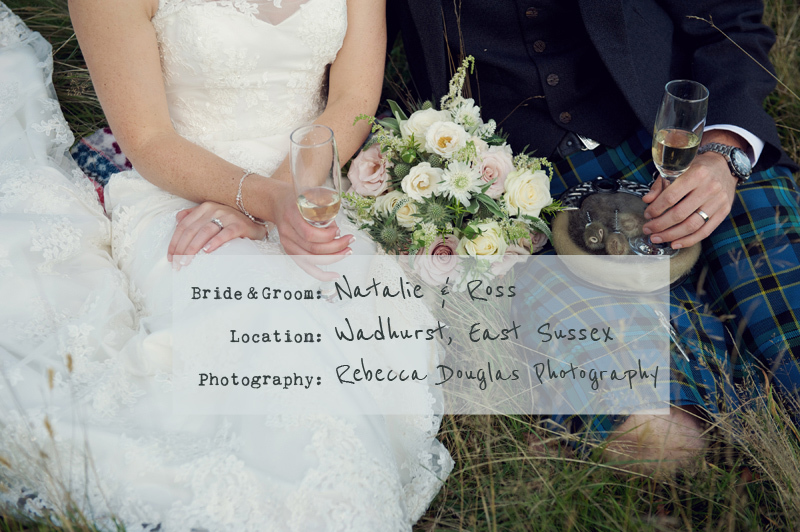 By jove have we got a corker of a wedding for you this morning; a beautiful Scottish and English inspired affair set in the woodlands of Natalie’s childhood home under the trees. There is possibly the best profiterole wedding cake that I ever did see, a beautiful lace frock, an ACTUAL family tree, kilts a-plenty and the most luxurious buxom blooms to boot. 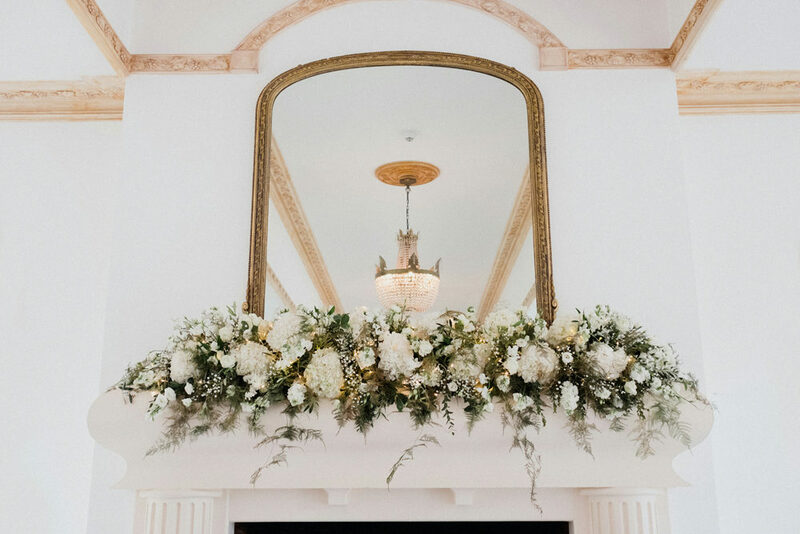 Yes lovelies, it’s more than a little bit handy to have a sister that’s an uber talented wedding florist – one of whom RMW has actually worked with on our I Believe In Mermaids shoot last year. And believe me when I say that Katherine is GOOD. I promise that this morning’s wedding will warm the cockles of your heart – particularly when you see the orange kilts. Immense! By gosh, have we got a sartorial treat for you lovelies this morning. 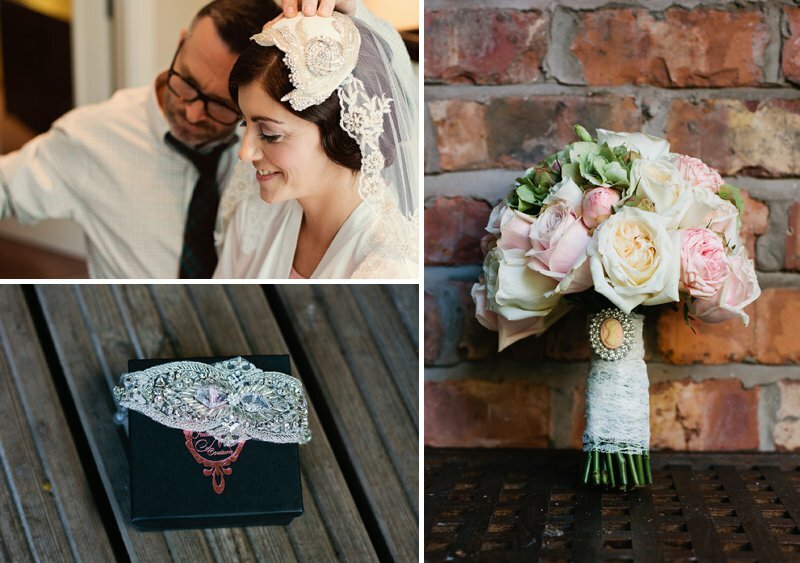 The beautiful Helen chose to channel a bit of Audrey in her vintage inspired wedding to the dashing James last year. 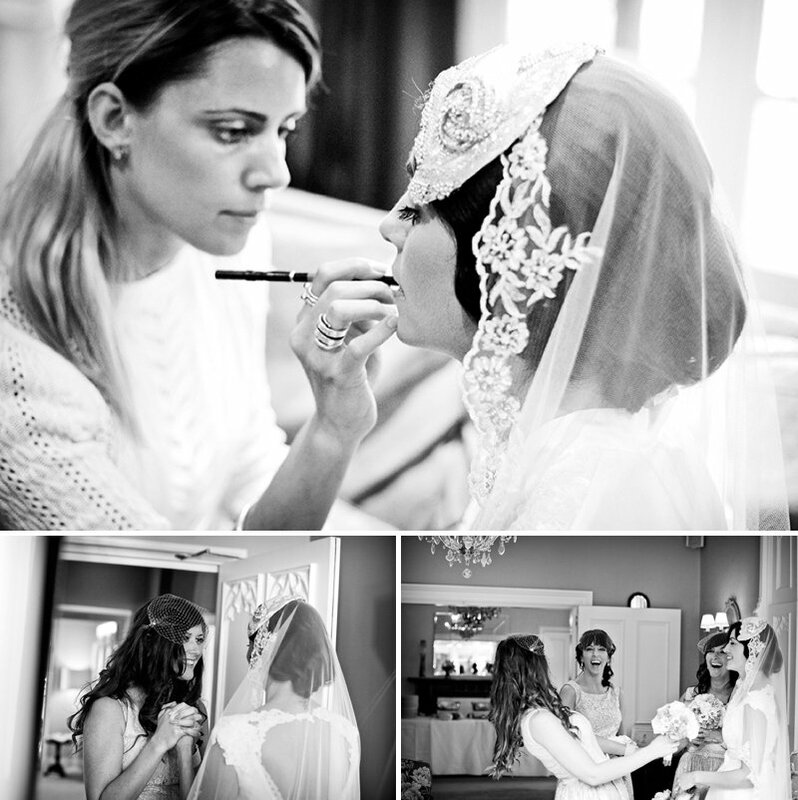 Think catflick eyes, a slick of scarlet lippy and one of the most beautiful veils I’ve ever seen. Honestly when you’ll see it, you’ll go green with envy. I also have to say that serious style points have to go to James who looks achingly hip – especially given that he only managed to find the suit of his dreams a week before the wedding. I know! And that’s not all. There’s a beautiful cake, a wedding breakfast bbq, the sweetest dessert table and some exquisite florals. 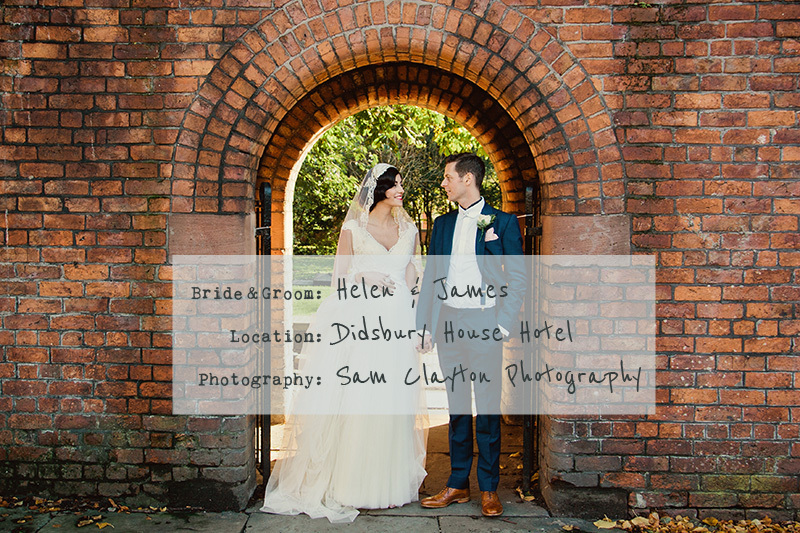 Helen The Bride:The venue for our perfect wedding day was Didsbury House Hotel in Didsbury, Manchester which is part of the Eclectic Hotels Group. 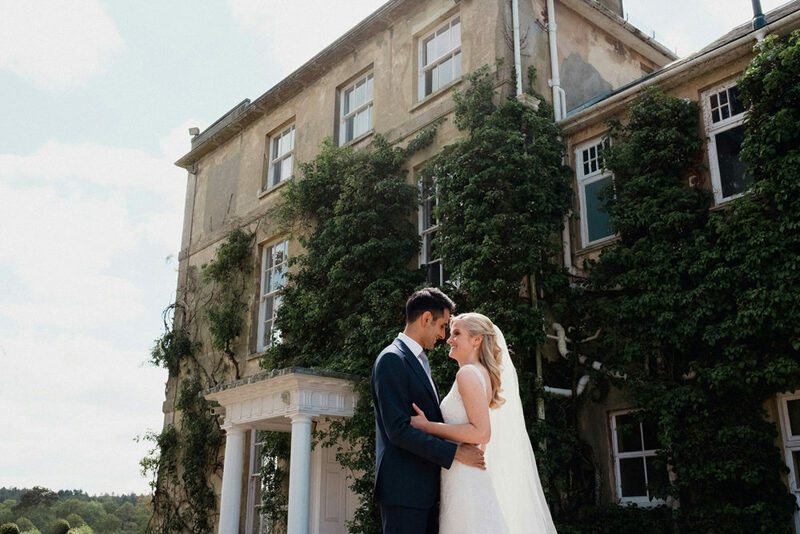 We wanted our wedding to be intimate and relaxed and for the whole day to feel like a rather grand house party. Didsbury House Hotel was the perfect size and has an extremely relaxed atmosphere which made it perfect for the kind of vibe that we were hoping to achieve. We also wanted somewhere which had character and had the kind of interior styling that we liked, it was important to us to have this and not just a function room in a large hotel. 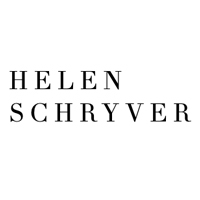 I love the classic looks of years gone by, in particular the 1940’s and early 1950’s and looked to this era for the inspiration for the beauty styling. Not wanting to go for traditional wedding make up with neutral lips, I opted for a classic flick on the eyes, Audrey Hepburn style and a bright Chanel lipstick with matching nails. The bridesmaids opted for pale pink hues to compliment their dresses. The make up was done by Lauren Coombes at Cheshire Make up, who is absolutely amazing, all of us absolutely loved our make up on the day, I only wish I could have Lauren come and do my makeup every day of the year! The hair on the day was also in a classic 1940’s finger wave style. The look was achieved using curling tongues from the root and the hair was pinned up and under to achieve a classic shape. Hair was styled by Paul Quinn from Harper and Quinn in Wilmslow www.harperandquinn.co.uk and we worked on it for months with lots of trial sessions to get exactly what we wanted. I think we were both very pleased with the end result. The dress was a vintage inspired Lusan Mandongus Gown. Lusan Mandongus are fabulous at creating a vintage look with a modern twist – perfect for the look that I wanted. The dress had a combination of lace, satin and tulle and created a classic and soft sillouhette. I had in my head exactly what I wanted and as soon as I walked into the bridal shop that day I saw it. I tried lots of other dresses on first and saved that one until last and then as soon as I put it on, both me and my mum were like ‘yes, this is it!’. The inspiration for my styling and accessories came from an old wedding photograph of my grandparents which was taken in the 1940’s. My grandmother wore a bridal cap for her wedding and had her hair exactly how I wanted mine in finger curls. I absolutely love the picture and decided I should try and create a modern take on her look. And so the hunt started for the perfect bridal cap which was a bit of a mission as I knew exactly what I wanted in my head and wanted it to be exactly right. I also wanted to wear a veil so searched hard to find a combination of the two that matched. Both were purchased from the Etsy website, which is a vintage magpie’s heaven! I wore a soft cuff bracelet embellished with pearls and diamantes also purchased from Etsy. Underwear was from Agent Provocateur; I love AP so I knew that my trusted wedding undies had to come from there! I also wore a fabulous pearl garter with a satin bow from a lovely lady at Britten Weddings; they have some really unusual bridal accessories. My shoes were from Dune and were gold with silver sequin detail and peep toe. I didn’t want to go for a traditional plain bridal shoe, I wanted something fun which I could wear again and these were the perfect pair. I had three bridesmaids who are my closest friends. The bridesmaids wore pale pink lace knee length dresses from French Connection with belts which I made using lace and Cameo Brooches. In their hair the bridesmaids wore birdcage veils also made by myself after the ones I had ordered online got stuck in customs! The shoes were from the Jenny Packham range from Debenhams and were pale pink with diamante detail and peep toe. 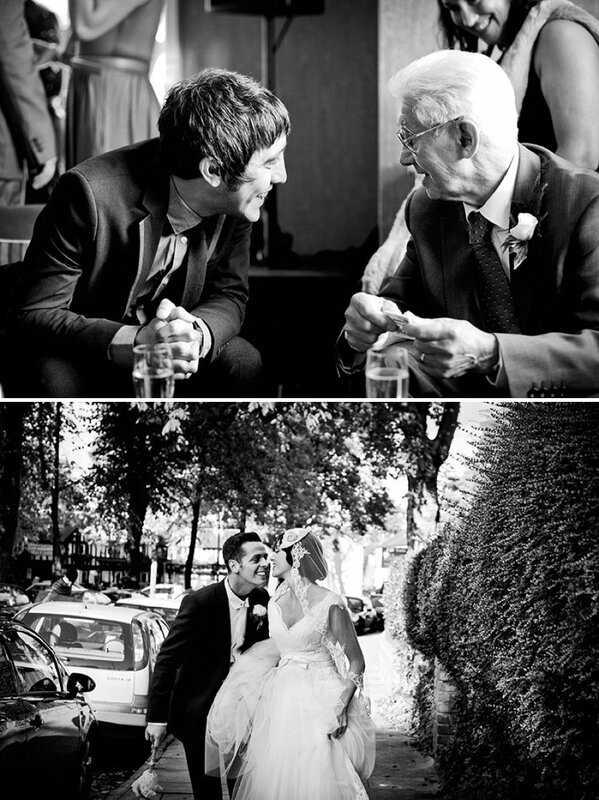 James had a complete nightmare finding a suit that he liked for himself, the best man and my Dad. He looked for months on end and we only got the suits for the best man and my Dad literally the week before the wedding! In the end, James wore a custom made navy suit from Reiss with a white shirt, pink pocket square, blue braces, neck scarf and brown brogues. He looked very good on the day, a real gentleman. The best man and father of the bride wore William Hunt suits in navy. The main colour featuring throughout was a very pale pink but because we wanted to achieve an eclectic mix of colours we also mixed in creams, pale greens and blues and silvers which also complemented the décor in the venue. The fabulous flowers were provided by Sian at The Flower Lounge in Didsbury. 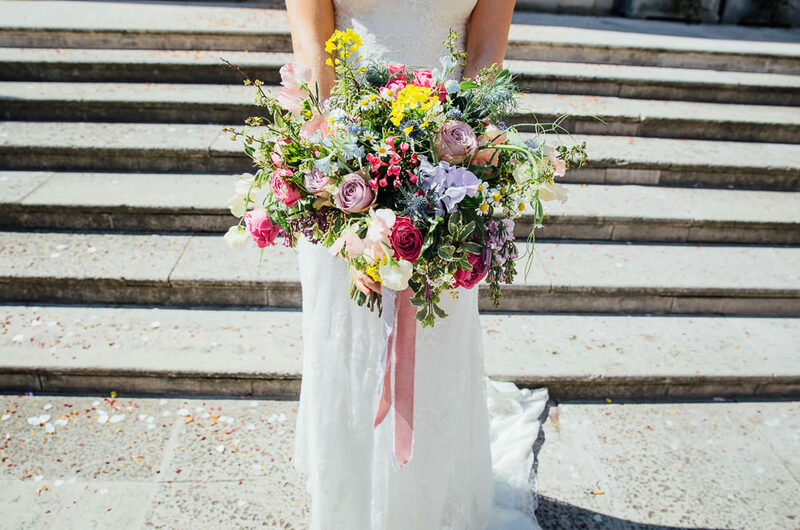 I wanted the flowers to be soft and pretty in colour and with the flowers used and opted for pastel colours throughout. I wanted neat looking bouquets without lots of foliage. The main flowers used were Roses of all varieties and Hydrangeas. I carried a large hand tied bouquet bound with lace and a pink cameo brooch to match the belt of the bridesmaids and the bridesmaids carried smaller versions of the hand tieds. 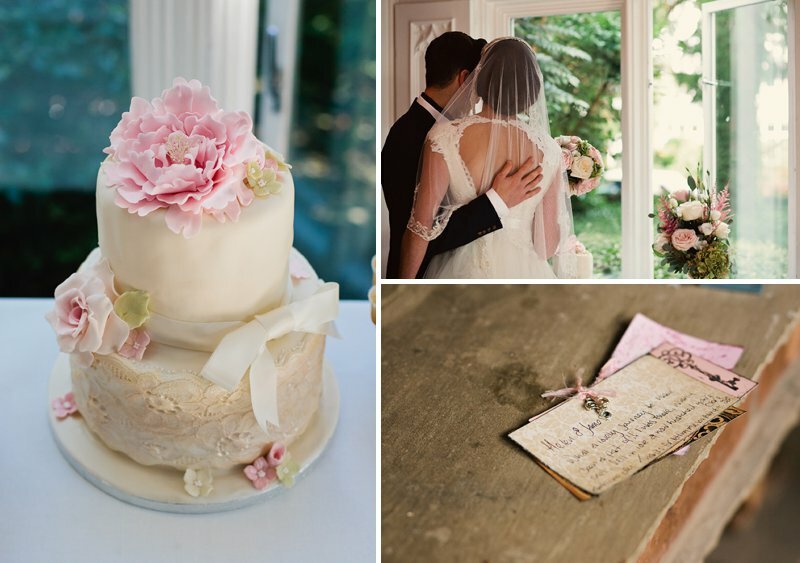 James wore an ivory Rose, and the best man and father of the bride wore pale pink roses with a sprig of Rosemary bound in lace to match the bridal party. The flowers throughout the venue were kept informal with a collection of vintage vases filled with hand tied arrangements on the ceremony table and then smaller arrangements were scattered around the venue in vintage tea cups and saucers which I had been collecting for months from various places. Tall floor standing candelabras were also decorated with flowers. We opted for a civil ceremony which we felt helped to create the relaxed and informal mood tone for the day.I walked down the aisle to our favourite classical song Clair De Lune and we stood to be married in the most beautiful bay window in the hotel with the fabulous October sunshine flooding through. We both beamed and smiled throughout the whole service, we also did lots of giggling and laughing especially when I kissed James and covered him in bright red lipstick! Our dear friend Beki read a piece of text from the book Captain Corelli’s Mandolin which is one of my favourites. Once we were married and had signed the register we left the room to ‘From this Moment on’ sung by Ella Fitzgerald who we both absolutely love! 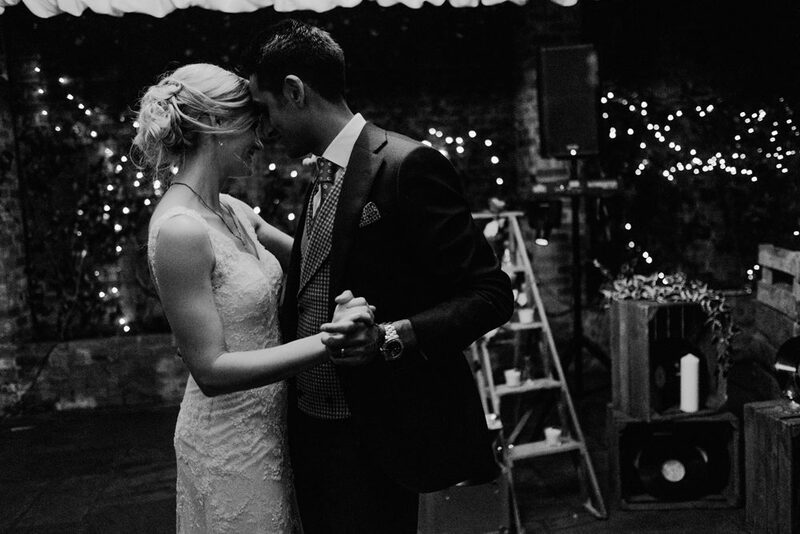 We are both massive fans of music and we spent goodness knows how many hours on the run up to the wedding putting together a playlist of music which was carefully selected to create the mood that we wanted for different times throughout the day. The music was played throughout the reception during the day whilst everyone chatted and those that hadn’t met before got to know one another. Late afternoon we had an acoustic set from Tom Jarvis; Tom sang a variety of songs including some Ben Howard as well as some other favourites including ‘Your love gets sweeter every day’ by Finlay Quaye, which was dedicated to me by my lovely husband. Our first dance was to yet another Ella number, I love you madly, which we always dance around the kitchen to at home at any given opportunity. We didn’t really practice our wedding dance but I think we just about pulled it off in the end. The music in the evening was a set by a brilliant Manchester DJ and friend, Peter Jay and my only complaint would be that it all went far too quickly! The catering for the day was provided by the hotel with canapés early doors including mini steak and Guinness pies and other tasty morsels washed down a glass of prosecco. We then opted for a BBQ which had just about every kind of meat and fish you can possibly think of; it really was a treat and something for everyone’s tastes. The cakes and cookies were a real talking point of the day and were that beautiful to look at, everyone was scared to eat them! They were made by the beautiful Jane at Cookie Couture who did such a fantastic job. The Vanilla cookies looked like vintage brooches with exquisite detail. 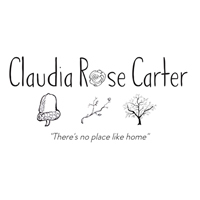 They were decorated with pearls, lace, cameos, roses and hydrangeas. The cake was two tier with champagne buttercream and again featured lace and a beautiful pink rose and green hydrangeas to match the bouquets. There were also mini cupcakes which went down a treat! There was also a fruit cake lovingly made by my mum to finish off the cake table. Because I also love my sweeties, there was another table filled with vintage sweeties including bon bons and love hearts. Since there wasn’t a sit down meal, as we opted for the BBQ, we didn’t have formal favours. However next to the signing register, I left a treat for the ladies, a large jar of perfume samples in little vintage boxes including Vivienne Westwood and Agent Provocatuer. The invites were important to us and we wanted them to reflect the informality of the day. I made the invites myself which featured pink roses, pink ribbon and cameo brooches on each. Everything was purchased from Imagine DIY. 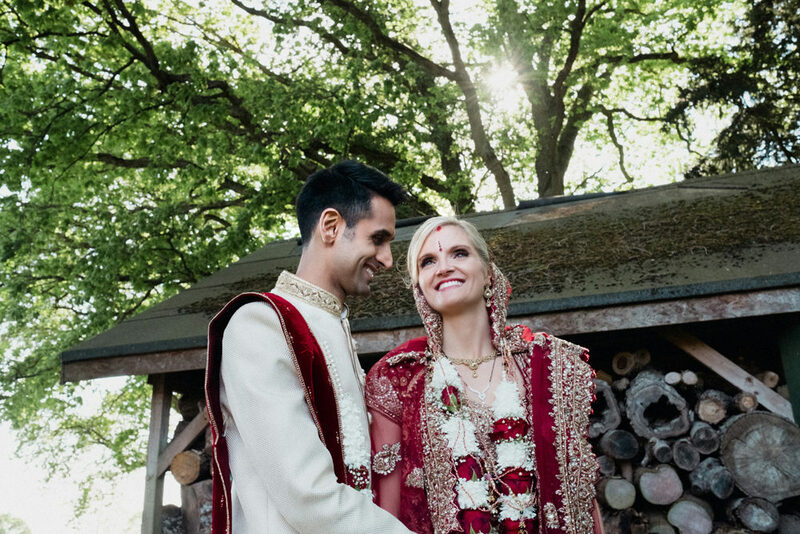 Our wedding day was all about celebrating our love with our closest friends and family and having a day which totally reflected our personalities and everything that our relationship symbolises. Everything that is important to us we wanted to feature and we tried to reflect this in the detail. We wanted the day to be fun and more than anything we wanted ourselves and our guests to laugh and have lots of happy memories. The other thing we did on the day which I would recommend to any bride and groom was to go off for an hour and have some photographs taken on our own. The whole day flies by so quickly and you barely get the opportunity to speak to each other and just reflect on everything. It was important to us to just have that alone time together to say all of the things that we couldn’t with everyone else around us. We went to a local village green for our photographs in Chorlton and got lots of cheers from everyone sat outside the local pub when we rocked up in our wedding gear! I would urge any bride and groom to be sure of the style of wedding photographer that you like and be 100% happy with your choice. We didn’t put enough emphasis on our photography in the beginning and were trying to do things on a shoe string and then changed our minds completely and I am so pleased that we did that. 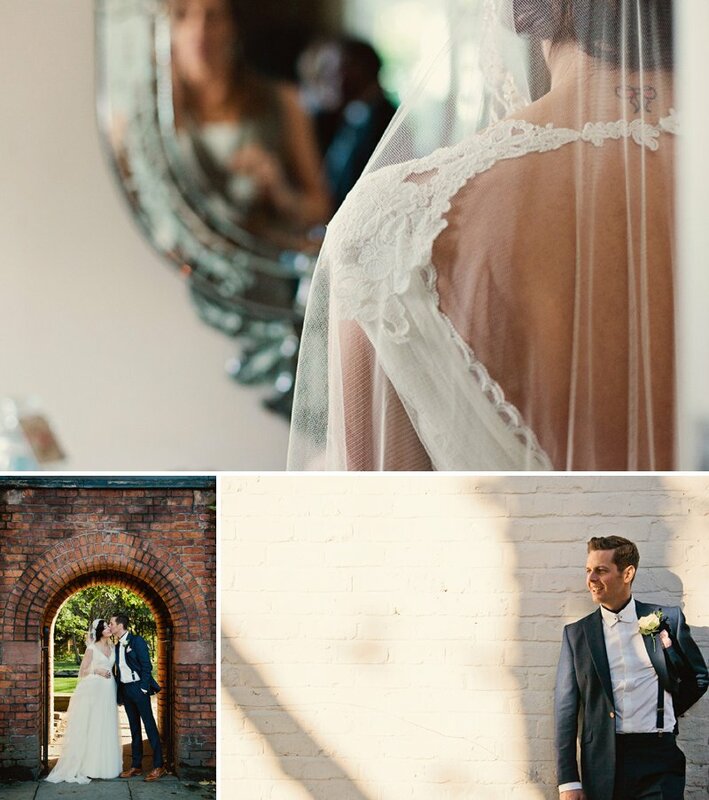 Sam Clayton did such an amazing job of the pictures and they are exactly what we wanted – a relaxed editorial style. Sam and her assistant made everyone feel so comfortable on the day and I have to say I love the final result. Everyone who has seen them has commented on just how fabulous the photographs are and we are both over the moon with them. We ran out of time on the day and threw our confetti at night which I think was a first for our photographer Sam! I was glad we did that too as it was a bit different and we got some brilliant shots. Finally, my advice to any bride and groom is don’t always go for tradition. Think about what makes you a couple and what makes up your personalities and put together a day which depicts that. That way it will be a true reflection of your love for one another and will give you a lot of beautiful memories that you will cherish forever. Confetti throwing at night? Ummm hell to the yes. Which of you will be trying this new tradition then?